The Tanner Lectures on Human Values, founded July 1, 1978, at Clare Hall, Cambridge University, was established by the American scholar, industrialist, and philanthropist Obert Clark Tanner. Lectureships are awarded to outstanding scholars or leaders in broadly defined fields of human values, and transcend ethnic, national, religious, or ideological distinctions. 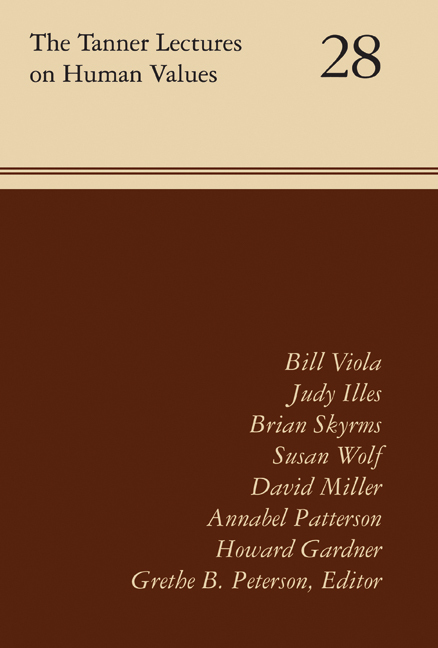 Volume 28 features lectures given by Bill Viola, Judy Illes, Brian Skyrms, Susan Wolf, David Miller, Annabel Patterson, and Howard Gardner. Grethe B. Peterson is director of the Tanner Lectures on Human Values. She lives in Park City, Utah.